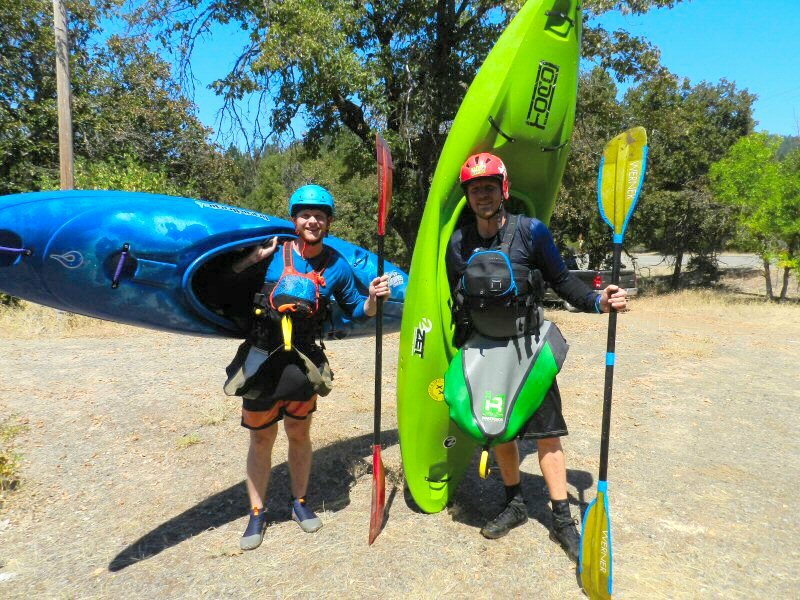 Saturday August 13, Kayakers from Northern California, Nevada, and Oregon gathered at the Madesi River Access above Big Bend to enjoy the thrill of riding level III, IV, and V rapids on a 9.3 mile stretch of the Pit River. This was the first day of the first of two weekends in 2016 that PG&E will be providing high water flows on the Pit 5 Reach of the Pit River from Pit 5 Dam to the J.B. Black Powerhouse. By 10 a.m. PG&E had increased the flows from 450 to 1500 cubic feet per second. They remained at this level until about 4 p.m. when they were gradually reduced to 600. Sunday morning the flows were raised again to 1500 and the after 4 p.m. gradually lowered back to 450 feet per second. The most challenging stretch is from Madesi River Access to the bridge at Big Bend. There is river access just below the bridge. From Big Bend to J.B. Black Powerhouse the ride is easier. My wife Linda and I arrived at 12:30 p.m. to watch the kayakers come round the bend in the river and ride the white water above the bridge. 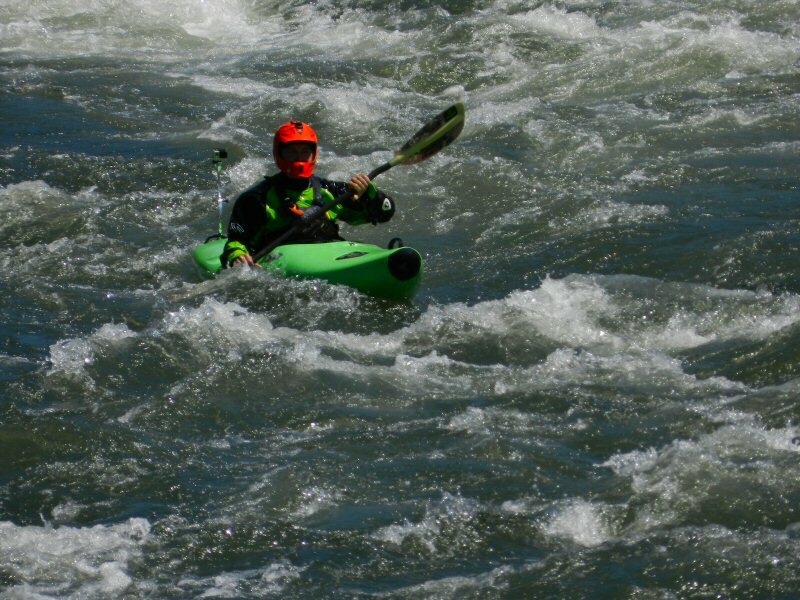 It’s fun for the kayakers but it’s fun for photographers too. As we walked out onto the bridge, we saw two watchers from Spring Rivers. Spring Rivers is a company that provides biological and physical assessments of aquatic and riparian ecosystems. 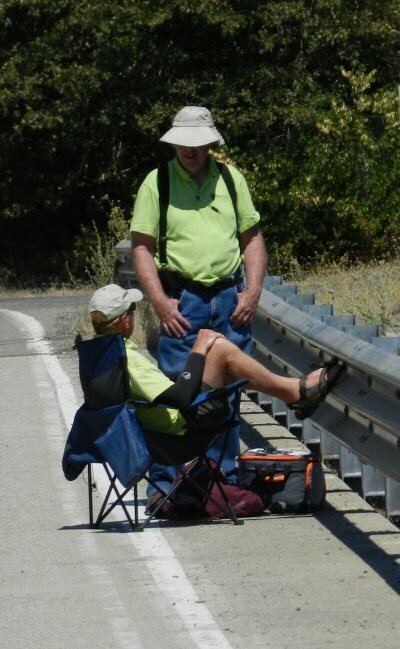 PG&E contracts with them to monitor the event, registering the kayakers at the Madesi access and then keeping count as they pass under the bridge and disembark at the Bridge access or J.B. Black Powerhouse. By the time we arrived, one raft and 13 kayakers had passed below the bridge. A Spring Rivers truck arrived and told us that so far 32 kayakers had registered. 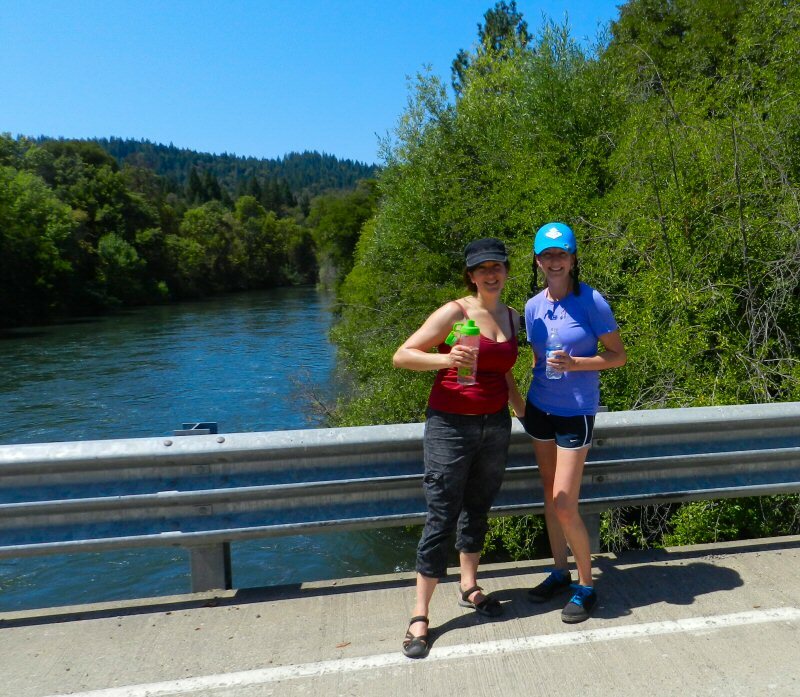 As we waited for more to appear round the bend of the river upstream, we met two of the group of 32, Sarah from Fair Oaks and Erica Gold from Oakland. Sarah and Erica had opted to wait for some friends to ride the current to the bridge and then join them to ride down to J.B. Black Powerhouse. One of them had done this run in a previous year. The other hadn’t but had kayaked the Pit One run that goes over Pit River Falls to the Pit One campground. She said that was really exciting. They told me that they were part of a group of kayakers that had gathered together for the weekend. In addition to Fair Oaks and Oakland, friends came from Reno, San Jose, Coloma near Placerville, and Trinity County. And soon they did. A whole slew of them riding the rapids. 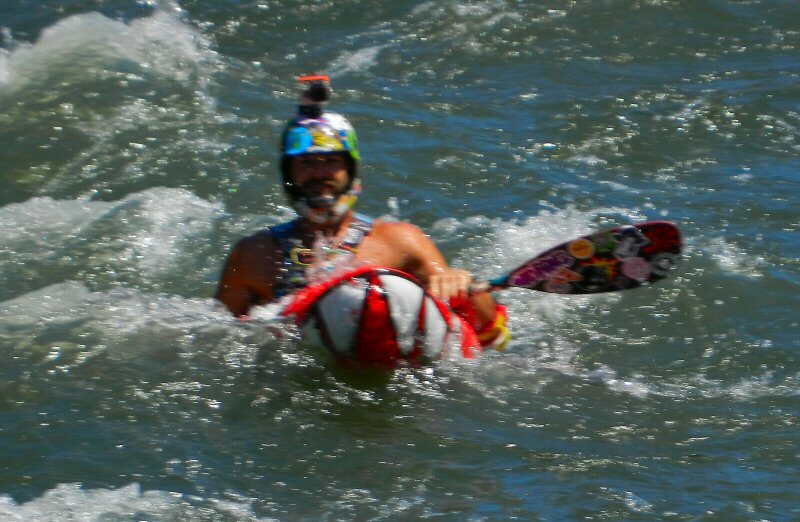 After they had passed under the bridge, I went down toward the access to meet some of the kayakers. I asked one of the Tylers from Oregon how the ride was. They loaded their kayaks on a vehicle to head up for another run. I went back to the bridge. Linda and I were thinking of heading home. However, I looked upstream and another batch of kayakers had just rounded the bend. I think that more riders must have registered because we were now well above our count of 32. 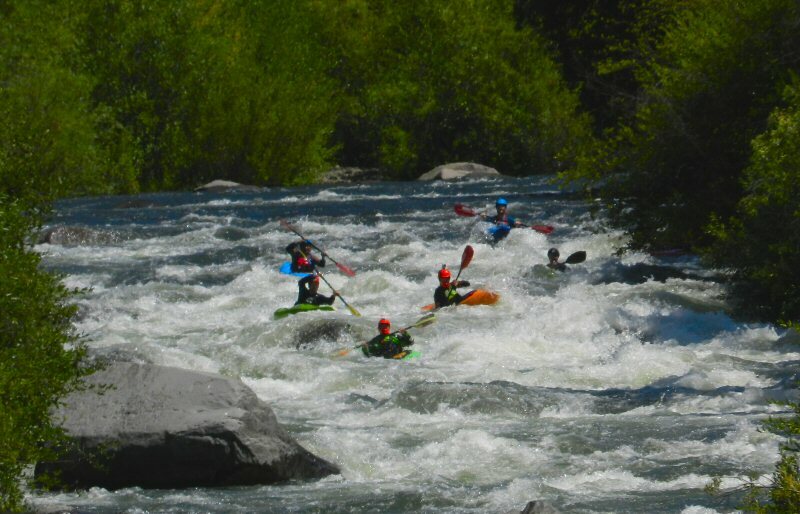 Most of the kayakers planned to ride the river through the afternoon up till 4 p.m. and then camp together overnight so they could enjoy more runs the next day. More will probably come on Sunday to join in the fun. Sarah had explained that whitewater kayakers are a community. 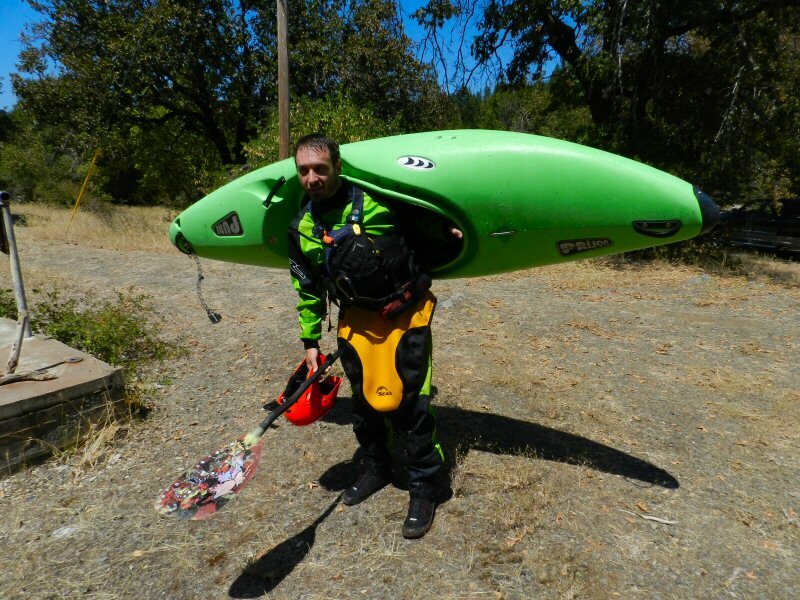 Many are friends who have kayaked together at various locations. 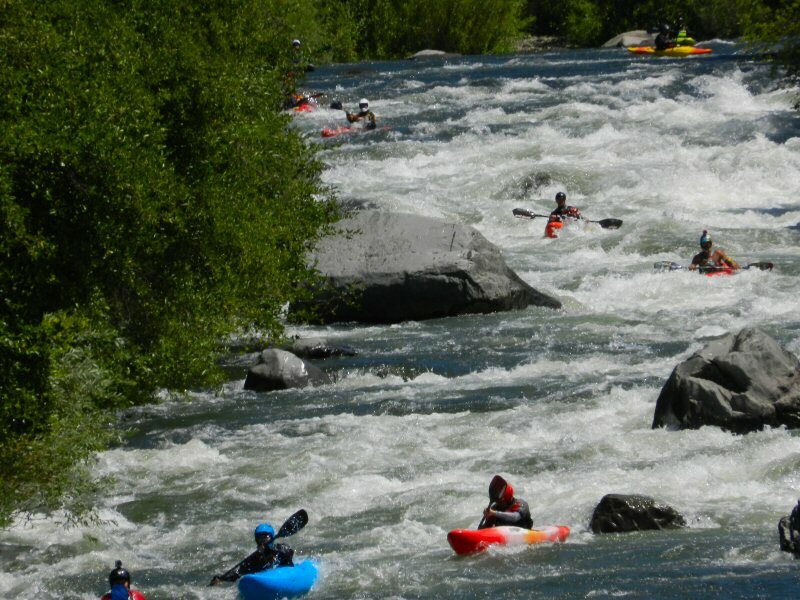 American Whitewater advertises the whitewater opportunities and groups of friends reconnoiter to navigate the flows. The next weekend that PG&E will increase flows will be September 10-11. On both of those days, they will raise the flow to 1200 cubic feet per second. 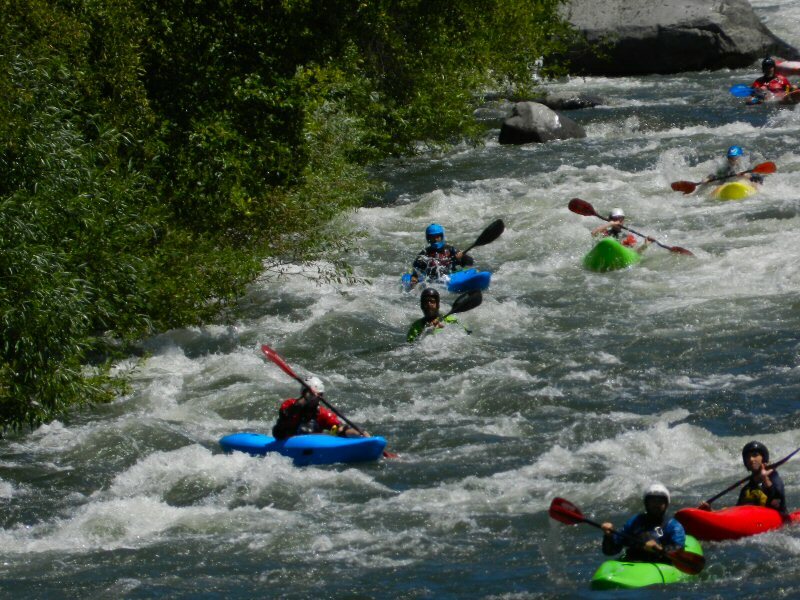 It certainly is a rush when the rivers are rising and the riders are riding the whitewater flows. always wanted to do that! thanks for another fun and interesting article Alex!! Thank you for being such a wonderful human being.